EARTH’S moon has a split personality. One half of its surface—the half which, thanks to the vagaries of orbital mechanics, always faces Earth—is dominated by dark, smooth expanses of ancient, frozen lava known as maria (early astronomers, thinking they might be bodies of water, named them after the Latin word for “sea”). The contrast between the darkness of the maria and the brightness of the surrounding highlands forms a pattern popularly known, depending on the culture of the observer, as the man in the moon, the rabbit on the moon or one of many other optical illusions. Selenologists, as those who study the moon call themselves, have kicked around many theories to explain the differences between the moon’s two faces: Earth partly shielding the moon from meteoritic impacts; uneven heating from beneath; the collision that excavated a 2,500km-wide crater at the lunar south pole, one of the biggest in the solar system. None seems satisfactory. But in a paper just published in Nature Martin Jutzi and Erik Asphaug of the University of California, Santa Cruz, examine yet another idea. This is that the mountains of the lunar far side may be debris left over from an even bigger collision than the one at the south pole—a collision that left lumps on the lunar surface rather than digging holes in it. The most widely accepted theory of how the moon formed suggests it is the result of a cosmic smash-up between Earth and an object roughly the size of Mars that happened about 4.5 billion years ago during the solar system’s turbulent youth. This impact would have sprayed huge quantities of material into space, forming a ring around Earth similar to, but much thicker than, those that now adorn Saturn. The moon is thought to have condensed rapidly from this ring. Computer simulation of the process suggests, however, that several smaller moons may have formed at the same time. Some would then have collided with Earth or the moon, while others would have been ejected from the system altogether. But one or more of them often end up, according to the simulations, in what are known as Trojan orbits, where they followed the proto-moon endlessly around Earth. Or, rather, almost endlessly. For the hypothesis of Dr Jutzi and Dr Asphaug is that a large moonlet did eventually catch up and collide with the proto-moon—at a relatively low speed given that they shared an orbit—and produced the highlands on its far side as a result. To test their theory, the two researchers simulated such a collision on a computer. They found that, assuming the second moon was indeed smaller than the main one, and was made of similar stuff (which, given that it is assumed to have formed from the same ring of debris, seems reasonable), then a comparatively low-speed collision at around 2.4 kilometres a second would mean that much more material from the moonlet was deposited on the lunar surface than was blasted off by the impact. Most of the excess rock, moreover, would have stayed near the point of impact, covering about half of the moon with a thicker, mountainous layer of crust—just what is seen on the real moon. Of course, computer simulations can say only what could have happened, not what did. For that, physical evidence is required. Some suggestive evidence does exist, though. For a start, the crust on the far side of the moon is indeed much thicker than that on the nearside. Also, because the second moon would have been smaller than the main one, it would have cooled and solidified more quickly, meaning that its rocks would be older. Sure enough, different parts of the present moon’s crust, recovered by various missions to the lunar surface, differ in age by up to 200m years, a fact that has long puzzled selenologists but which the impact theory neatly explains. 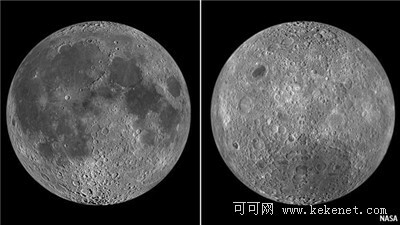 Moreover, such a huge collision on the far side would have shifted much of the magma ocean that then underlay the moon’s surface to the near side, which led to the formation of the maria. More evidence may surface when the Gravity Recovery and Interior Laboratory mission, an American spacecraft designed to map the moon’s gravitational field, arrives in lunar orbit in around six months’ time. That should yield a detailed map of the lunar crust, and how its thickness varies from place to place. But the best way to check the new hypothesis would be for selenologists to get their hands on rocks from the far side. Sadly, that is unlikely to happen soon. Neither America nor Russia has any sample-recovery missions planned for the moon. China does (scheduled for 2017). But, like the American and Soviet missions of the 1960s and 1970s, the Chinese are expected to opt for the safety of a landing on the near side. Selenologists may therefore have to wait a long time before they can test the Jutzi-Asphaug model properly.